Custom designed engagement rings means the love of your life will receive a ring especially made with her in mind. Every choice you make reflects the love that you feel. The beauty of custom designing your own engagment ring? You have total creative freedom! Moissanite engagement rings. Our exquisite moissanite engagement rings sparkle like diamonds but cost just a fraction of the price. Ranging from virtually colorless to raspberry pink, our moissanite engagement rings offer size, quality and style that’s both stunning and affordable. 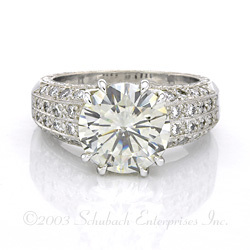 Choose from classic, affordable styles like solitaire engagement rings, or ask us about a custom moissanite ring. Choose a pave diamond ring. Derived from the word “pavement,” pave diamond rings are made using small cobblestones of tiny diamond clusters to create rings that appear to be paved in glistening diamonds. An unexpected setting. Although engagement rings are traditionally set in gold or platinum, palladium engagement rings offer a modern, affordable alternative that’s equally lovely. This white, hypo-allergenic, lightweight and durable setting provides the perfect shimmering canvas on which diamonds and moissanite stones can truly sparkle. Unique side stones. Whether you select a diamond or moissanite engagement ring, you can customize her ring using side stones in standout shades. At Joseph Schubach Jewelers, you’ll find moissanite in champagne and raspberry pink, as well as Gemesis diamonds in a beautiful array of hues – even rubies or sapphires. Whatever her signature color or favorite gem may be, you can accent her engagement ring with it for a singularly stunning look. Specially cut stones. Round and princess-cut stones are popular choices for diamond and moissanite engagement rings, but with our experts by your side you won’t have to be limited by the shapes you know or see in the case. From the timeless Asscher cut to the playful brilliance of a heart-shaped stone, we can help you create the perfect ring for the woman you love. So break the mold. Dare to be different. You’ll offer a ring that has your love built right into it! Beautiful hand engraved pave’ diamond ring with a round center stone and four rows of pave diamonds weighing approximately .55ct in total. Can accommodate a center stone size of 2ct+ and is shown with a 4ct. Tension Set Engagement Rings – the Right Choice for You?